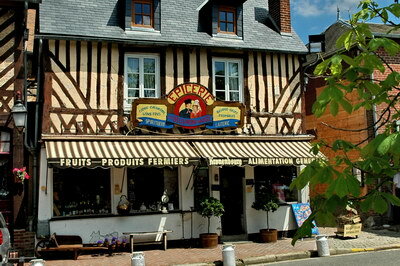 Here is a collection of pictures of some of the famous places you will just HAVE to visit when you are in Normandy. This small piece of Europe is still filled with the remnants of one of the largest military operations in man’s history and when you have any knowledge of what happened there in June 1944 you will be as awed as I am….. EACH time I visit. 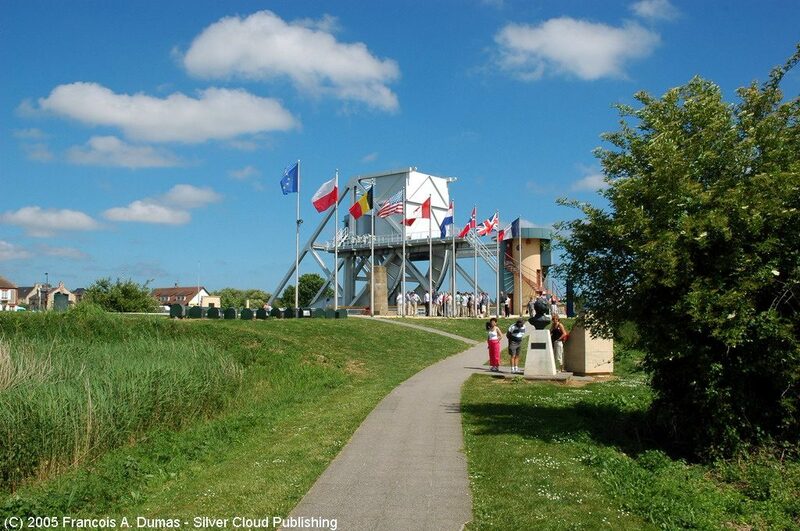 Above is a picture of the (new) Pegasus bridge. Can you imagine that people landed with huge glider planes on that bit of green you see there !!?? They did ! At NIGHT !!! AND they took the bridge from the Germans.. AND they held it until reinforcements arrived. 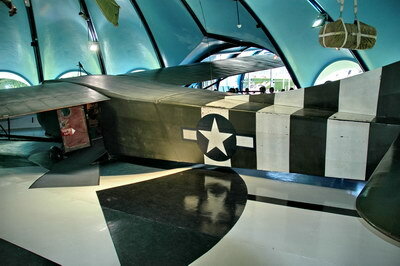 This is one of the Waco gliders used by the US troops. The Horsa gliders that landed at Pegasus bridge were of the round-hull type. Some of them could even carry a Jeep. 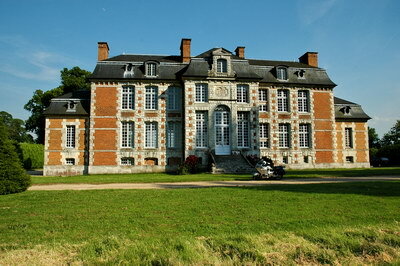 This one is situated in the Airborne Museum at St. Mère Eglise. 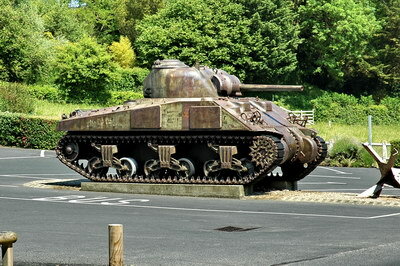 Below you see one of the British tanks, on a scaffold, situated just off the Pegasus Bridge. 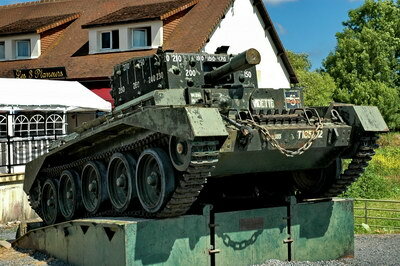 Probably one of the tanks that came to the rescue of the brave men of Major Howard, who led the attack on the bridge and subsequent seizure of it. There’s a museum just alongside the road, where the original bridge is stored (the on in the picture above is new ! Check out a website here ! And here is the official web site of the Pegasus Memorial. 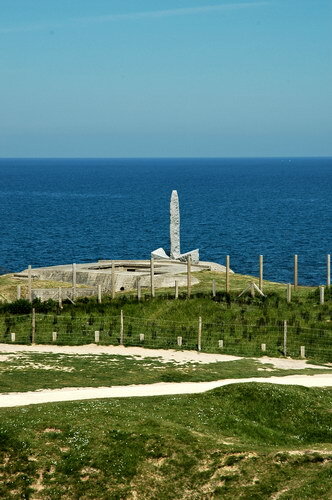 Two views from up the chalk rocks near Arromanches. 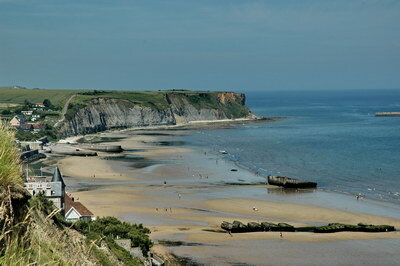 The first one looking west onto the beach at Arromanches (the church tower just visible on the left. This was the place where one of the two artificial harbours (Mulberry’s) were built. Many parts (huge concrete pontoons) are still out on the sea and a few can be seen laying on the beach in the foreground. 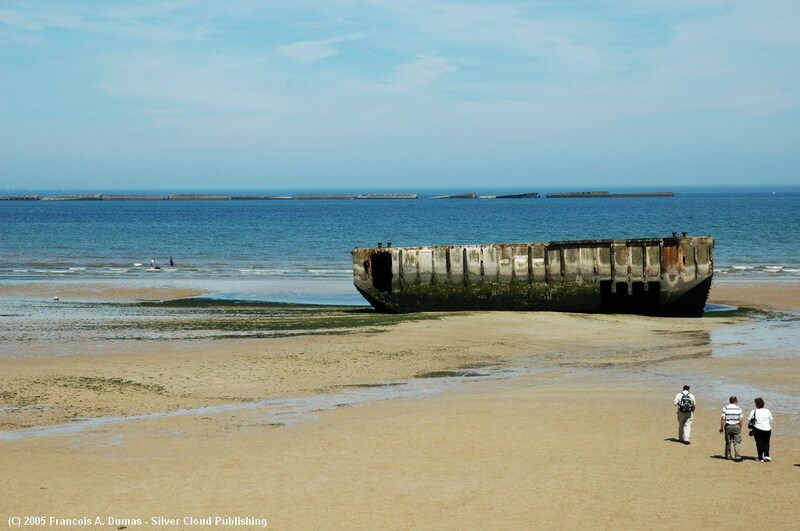 Here is one of the beached pontoons, and a whole line of others can be made out just on the horizon. They were large enough to let several rows of vehicles disembark simultaneously. 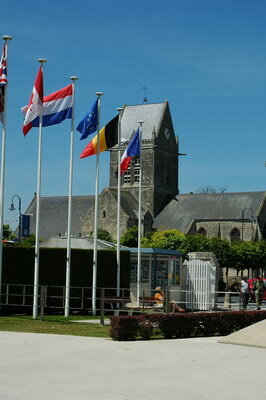 There is a good museum in Arromanches, just near the center and the waterfront. Its web site is here and you can find English text by clicking on ‘UK’ at the top, right. 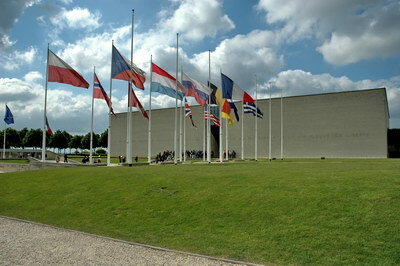 A tour through the museum takes around 75 minutes and is well worth the time and money spent! Lets ride back ‘inland’ for a bit, heading south from Arromanches through the rolling hills, covered with wheat in the early summer, as they must have been back then in June 1944. 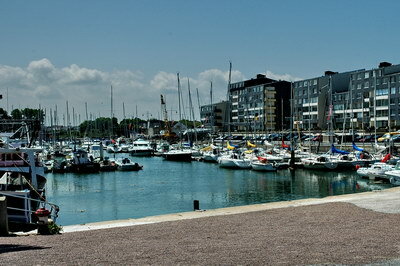 We are heading towards Caen, the main city along the Normandy coast. 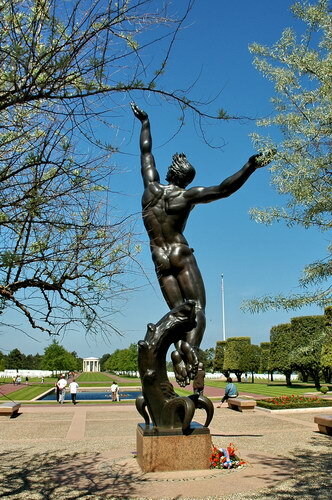 Caen has a highway going around its old town center, and in the new suburbs we find the Caen Memorial, a huge ‘war museum’….. or should I say ‘peace museum’. Its purpose is to show the wars sinece World War2 and urging visitors to NOT make those same mistakes over and over again. 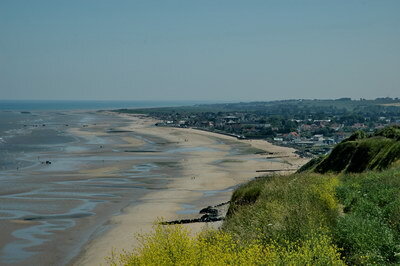 Back to the beaches then, towards Colleville and the US Cemetery nearby. 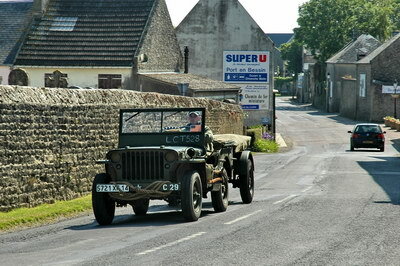 Here’s one of the many old Jeeps driving around the place, especially in June. One of my all-time dreams is to own an old Willys…. my wife still thinks my dreams are too expensive! 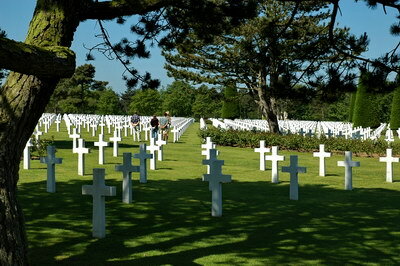 One of the most impressive places is this war cemetery just past Colleville on the coastal road. The photos don’t do it justice. It is HUGE ! 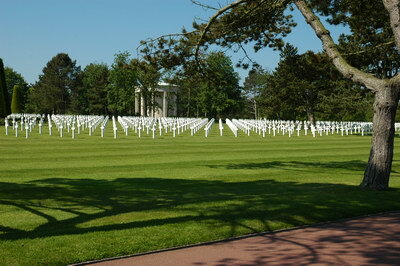 White crosses as far as the eye can see. Neatly aligned on a perfectly kept lawn. The whole place breathes a serenity and peace that is in stark contrast with the time these (all young!) people lived in .. and died in. 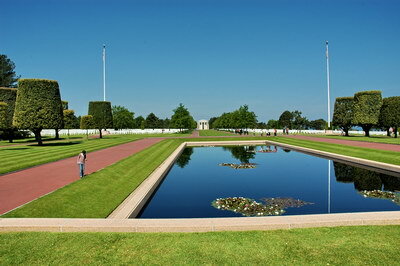 If only every person in the world would have a chance to visit here once, and realise what happened, and why…. perhaps THEN we would have less wars and conflicts. …… one can dream ! 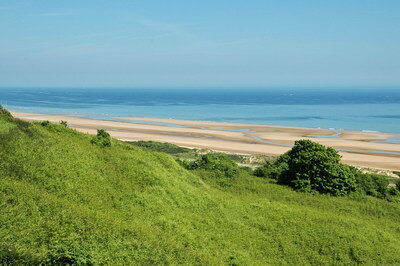 The beach below, forever known as ‘Omaha Beach’, where those boys came ashore, now looks calm and quiet too, more than 70 years later. Only movies, photos and books ….. and these white crosses…. remind us of what went on down there. There are so many things to see. 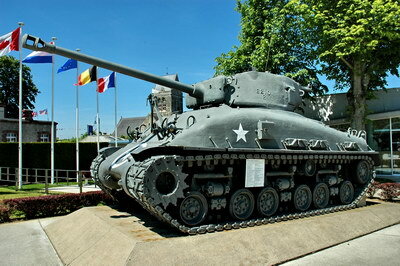 Also along Omaha Beach is Vierville, where we find an old Sherman tank, field artillery and parts of a Bailey bridge. There are old tanks everywhere along the route. And sometimes we find a little ‘extra’. 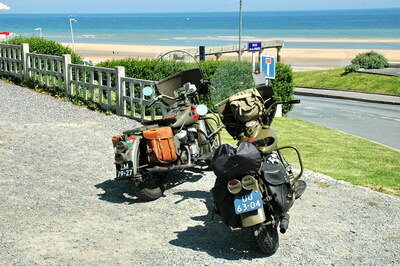 Like these wonderfully kept army bikes from that era, owned by a few enthusiastic Dutch riders who brought them over on trailers, just to ride along the beaches and Normandy roads in old fashioned style. 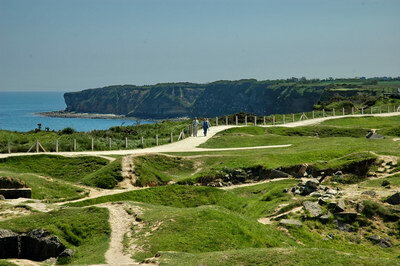 The next three photos are made on the Pointe du Hoc, a forbidding 100 feet cliff splitting Omaha Beach in two and housing a number of German artillery pieces at the time (or so it was believed), The rock was scaled by a US Rangers troop (the 2nd Rangers battalion) with unbelievable courage… and losses. Standing at the top of the cliffs it is beyond belief that these men actually had the courage to shoot up anchors with ropes and ladders attached, and climb up. All the time being shot at by German defenders who also threw hand grenades down the cliffs and cut the ropes. They not only managed to scale those cliffs, but battled the Germans and chased them out of their labyrinth of bunkers that were housed on top. It was ALSO a miracle that there was anybody alive at all after Pointe du Hoc was bombed by aircraft and ship artillery the way it was. The terrain looks pretty ‘undulated’ in that last picture. You’ll see when you walk up there that there is no 4 feet of flat land. ALL the holes and little hills are bomb craters. I’ve seen an old aerial photo and one can see that just about every square foot was bombed at one point or the other. 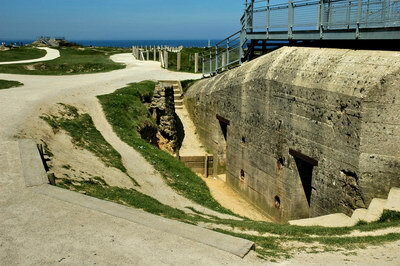 And still most of the bunkers survived, and so did the defenders. 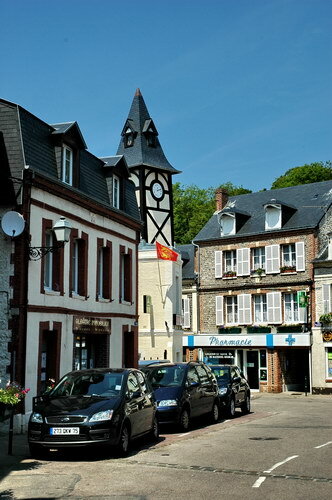 Our last stop on this little virtual ‘monuments trip’ is the famous village of St. Mère Eglise, the place where a severe battle was fought between elements of the 82nd and 101st Airborne Divisions. Many parachutists dropped into the well-lit main square… illuminated by many burning houses… and where shot while still on their parachutes. 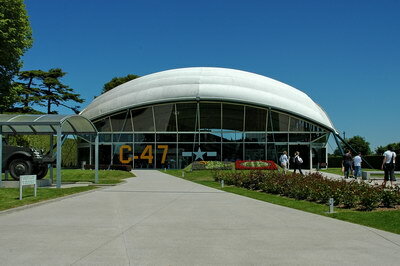 This is the main hall of the Airborne Museum. Inside you’ll find a C-47 and a WACO glider, several vehicles and a host of weapons and other bits of kit used in and around the area. This is the church in the center of the little town, seen from the museum grounds, looking towards the entrance. A Sherman tank with the bigger gun that some of them carried later in the war, to match them to the German Panzer IV, and Tiger tanks. This one is just inside the museum grounds. 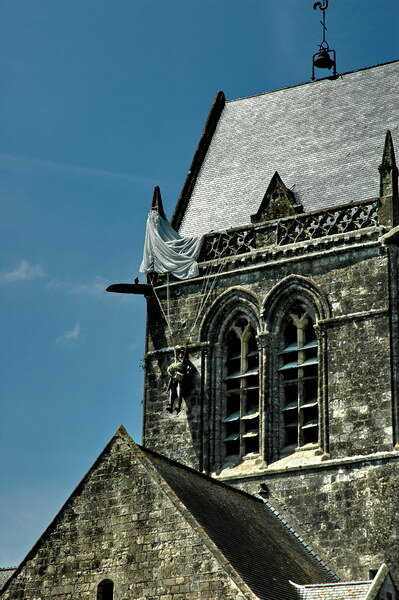 And here is Private John Steele, forever hanging off the church tower. His parachute got caught on the tower and there was nothing he could do, hanging helplessly from it. He was shot through his foot while hanging there, and went deaf from the church bells close to his ear. John Steel survived the war and a doll hangs from the tower ever since…. After so much telling, and riding, and stopping and making photographs, and more story telling… it is time for a break and something to drink. 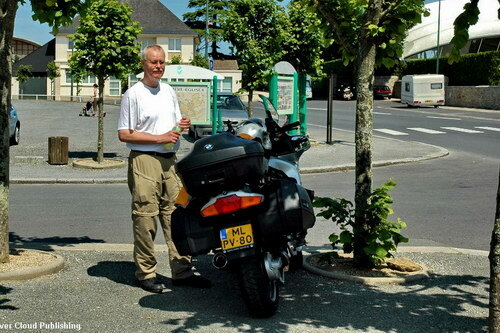 Yours truly parked on the town square in St. Mère Eglise…. as YOU will be when you ever come for a ride with me to these awesome places ! 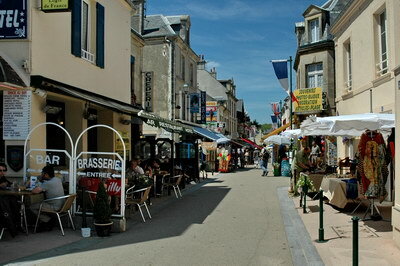 ‘main street’ at Arromanches. 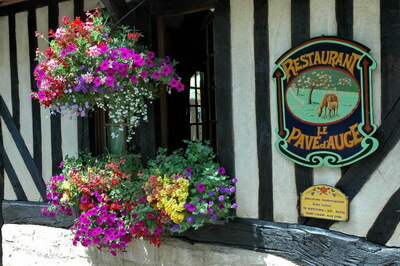 A great place to have lunch after having visited the museum there. 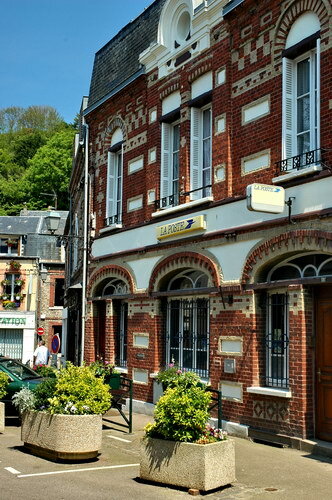 Port-en-Bessin. 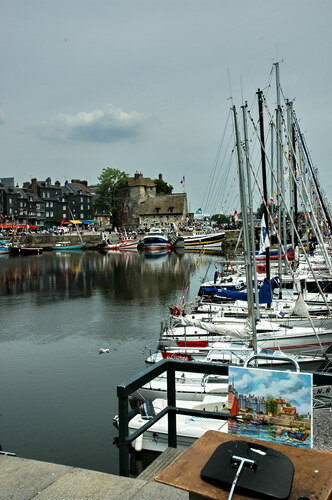 Many of the small coastal towns have these protected harbors. Nowadays mostly used for leisure boating and yachting, although there are still fishermen around. 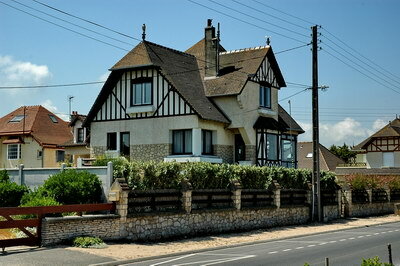 Many of these houses along the coast, this one near Ouistreham. There are even UGLY things to be found (of course). 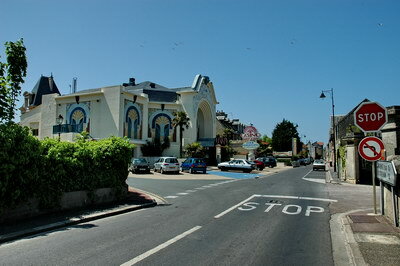 Here a casino, one of the older attractions of the coastal area, even before the war ! Going ‘inland’ one finds many of these lovely little roads. 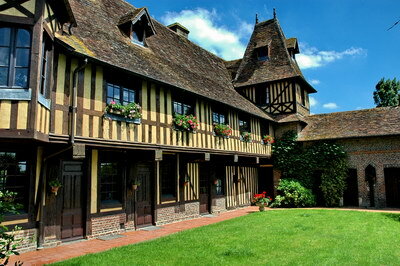 NOT meant to be speeding on a motorcycle, obviously, but very romantic and great for leisurely riding !And then we find the wonderful village of Beuvron-en-Auge, a place where time seems to have stopped. 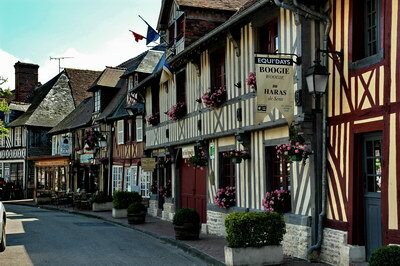 If it weren’t for the tourist cars parked everywhere, one could imagine being in a medieval village! 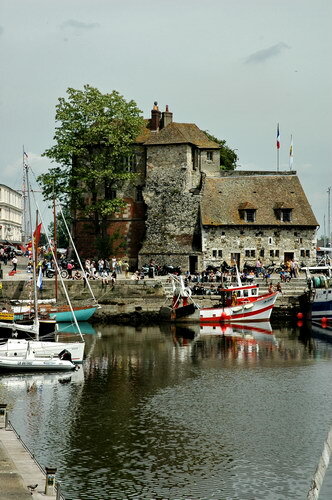 Near our ‘gîte’ is the wonderful little town of Honfleur with its world-famous harbor. This is one of the most-painted places in France and beyond. 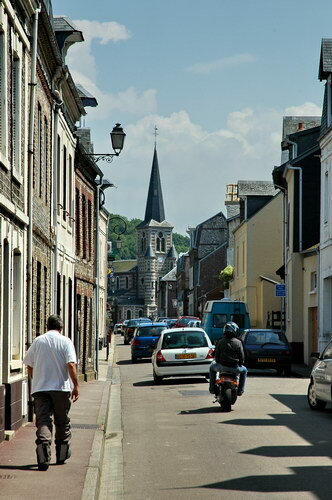 From Honfleur we cross the towering Porte de Normandie, the huge new highway bridge crossing the Seine river, cross through Le Havre and head for the coast again, winding up at Yport, one of the little coastal towns in the Pays de Caux, north of the Seine River. 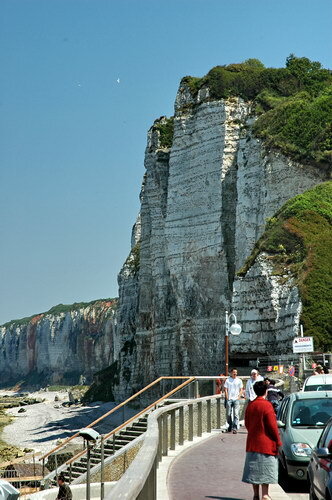 Here you’ll find the same kind of cliffs as on the other side of the Channel, steep white chalk . And narrow little streets of course (this is a one-way street, don’t worry). The Local post office also housed in one of the old buildings. 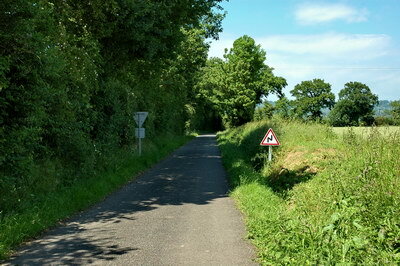 Yport lies at the bottom of the cliffs and a narrow winding road, with even a real hairpin in it, leads down to it from the surrounding countryside. 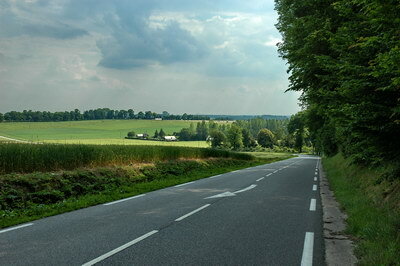 The landscape ‘on top’ is quite different, with rolling hills along the Seine. Here looking south on our way back ‘home’ to the ‘gîte’. And there another surprise awaits us. 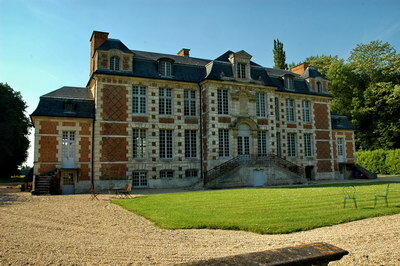 In the tiny village of St. Maclou a few guys have bought an old-ish castle, and are in the process of restoring it. Plan is to make it a rather luxury lodging… but for now one can visit it for a few Euros and be amazed at how people built things in the old days ! Great backdrop for a few motor pictures too ! And there is a LOT MORE to see…. more than fits on these few pages.